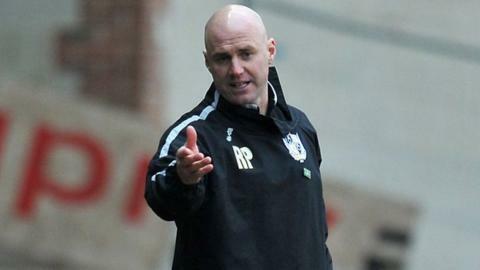 Boss Rob Page says he will not tolerate his Port Vale players easing off over the final four games of the season. With their League One play-off hopes effectively over, Page is adamant their focus will not waver. "Sometimes you can get to this stage of the season and take your foot off the gas," Page, 42, told BBC Radio Stoke. "But there's no way we're going to allow that to happen. While there are points to play for we've got to be professional and go for those points." Vale, 12th in League One, are nine points outside the top six and Page wants a huge effort over the remaining fixtures. "There are a lot of points to play for - whether it's for the play-offs or to finish as high as we can," he added. "There's everything to play for and I won't allow them to undo all the good work they've done this season and finish on a negative. "We've got four cup finals. We've got to finish strongly and take that momentum into next season." Although hopes of promotion are all but over, Vale are already five points and six places better off than last term when they finished 18th and only four points clear of the relegation zone. And Page is pleased with the strides the club, which is still up for sale, have made. "I've certainly seen an improvement on last year - even with the budget cut we had," Page said. "Recruitment is vital and we've made some cracking signings. If we can add a couple more in the summer it'll give a chance of improving again next year."